Choosing the right toothbrush is as important for the health of your teeth as brushing them properly. With such variety of tooth brushes, it becomes difficult to choose the best one. On the other hand, the advertisements and beautiful colors and displays make our decision even more difficult. Mostly, people go to buy the family packs of toothbrush. The family packs come with the same size and shapes. However, not every member of the family has the same size of mouth. Some has the wider while others have the narrower one. The younger family member has the smaller mouth compare to the elder member of the family. So how can the same size of tooth-brush can be used by all family members. It is important to use the toothbrush accordingly that is best suited for you. Below are the general guidelines to choose the right toothbrush for own self. 1) Bristles: Many dentists recommend the use of soft bristles to remove the plaque from teeth and gums effectively. Stiff bristles can harm the gums and can damage the filling material, gum tissues. On the other hand the medium bristles can have the same effect as of stiff bristles if used improperly. The safest kind of brush is the brush with soft bristles. 2) Shape of Toothbrush: It is advisable to use the tooth-brush with flexible neck. But however the use of non slip grip can also can also be used. It depends upon the individual choice to choose the shape whether rectangular or otherwise. The only thing to keep in mind is to choose the shape which ensures that it reaches to all teeth easily and fits your mouth perfectly. 3) Age: Choose the toothbrush according to your age. The tooth brush for 3 years old and 30 years old is different. So choose the one according to your age. 4) Head of the toothbrush: It is advisable to use the tooth brush with smaller head and wider at the bottom. This ensures that the bristle reaches to the back molars and back teeth comfortably. 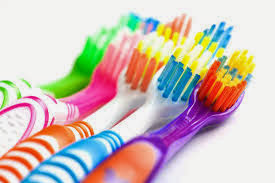 3) Do ensure that the toothbrush does not touch the other toothbrushes. 4) Before using the toothbrush ensure to rinse it with water. The right toothbrush can ensure the good oral hygiene is maintained and prevent from the tooth decay, dental plaque and gum diseases. I would lke to close the article with the famous quote by Clifford Stoll - "Treat your password like your toothbrush. Don't let anybody else use it, and get a new one every six months." Are you doing any of these 10 brushing mistakes?